Bing has been losing billions, is it worth it for Microsoft? A CNNMoney report this week estimates that Microsoft's (Nasdaq: MSFT) Bing "decision engine" is hemorrhaging $1 billion per quarter, and has lost a cumulative total of $5.5 billion since its launch in 2009. Bing is part of Microsoft's Online Services Division, or OSD, whose segment results started being disclosed in 2007. The division, which also includes MSN and adCenter, has lost roughly $8.4 billion since then, with the losses accelerating. Over the past three years, OSD has generated operating losses of $1.6 billion, $2.3 billion, and $2.5 billion in 2009, 2010, and 2011, respectively. It didn't help that Bing used to give away free money. Is Mr. Softy at least gaining market share? That depends on what you consider Bing's true market share. comScore (Nasdaq: SCOR) recently released its search engine rankings for August 2011, comparing Google (Nasdaq: GOOG), Yahoo! (Nasdaq: YHOO), Microsoft, AOL (NYSE: AOL), and IAC (Nasdaq: IACI)–owned Ask. Let's see how the market has changed over the past year. A couple of things stand out to me. First, people still actually use AOL to search. Second, Google's dominant position is largely unchanged year over year, hovering right around 65%. 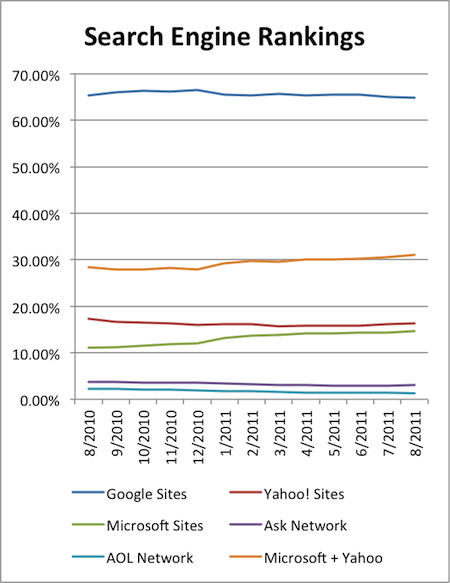 Another worthwhile fact is that since July 2010, Microsoft's algorithm and search platform has been driving Yahoo! 's sites, pursuant to a December 2009 agreement. So although Microsoft has grown its share partially at the expense of Yahoo!, those gains only cannibalize its partner. For even more detail, I went ahead and broke it down by month and added a line for Microsoft and Yahoo! combined. When including Yahoo!, Microsoft has grown its overall share, but not nearly as much as you would think judging by the company's figures alone. Meanwhile, top dog Google has barely flinched while the others fight for table scraps. Qi Lu, Microsoft president of online service, detailed the company's plans to "change the game fundamentally" with Bing in order to capture market share. The goal is to get a deeper grasp of what a user is looking for when he or she hits the search button, whether it's game tickets, flight information, shopping deals, or local businesses. Bing has a long, grueling battle ahead of it if it hopes to ever make a dent in Google's supremacy in the minds of netizens and wallets of advertisers. With $52.8 billion in cash and investments on the balance sheet, the software giant can afford to keep plunging money into its OSD and dream of sweet black ink. The question isn't whether Microsoft can continue, but whether it should. Stay up-to-date by using the links below to add these stocks to your personalized stock-tracking portfolio. Add AOL to My Watchlist. Add IAC/Interactive to My Watchlist. Add comScore to My Watchlist.